Montgomery County will be holding a “Work Session” on the Right to Vote Task Force on Monday October 13th at 2:00 pm in the Council Office Building, 100 Maryland Ave., 7th Floor, Rockville, MD 20850. The date, time and exact location for this meeting are tentative, so if you can pencil this in for now, we will confirm everything on October 9th. We need AS MANY Concerned Citizens to be at this meeting as possible. We will be able to observe this meeting but not testify, but we can still make our presence felt! PLEASE SPREAD THE WORD! WE NEED PEOPLE TO ATTEND THIS MEETING! The more the better. FREE State of Maryland Online Poll Watcher Training Courses are now available to anyone, just in time for the upcoming 2014 Elections! You can find out all the information about how to get involved at http://conta.cc/1yz7gqi or by visiting www.electionintegritymaryland.com/poll-watching. ROCKVILLE, MD – September 17, 2014 – Election Integrity Maryland (EIM) announces today that it strongly objects to certain recommendations developed by the Montgomery County Council’s “Right to Vote Task Force” on June 4, 2014, that leave the door wide open to voter fraud, as well as present flagrant violations of federal and electoral laws, as well as the U.S. Constitution. The Task Force’s recommendations will be presented in a Hearing scheduled for Tuesday, September 23, 2014 at 7:30pm in the Council Hearing Room, 100 Maryland Avenue, Rockville, MD 20850. EIM strongly encourages Concerned Citizens to attend and testify at this meeting in an effort to stop this outrageous violation of the law and our electoral process. Those interested may register to testify by calling (240) 777-7803. These recommendations present a perfect recipe for fraud, particularly the call to allow non-citizen voting, and online voter registration with no ID, in clear violation of The National Voter Registration Act of 1993, known as the “NVRA” and “Motor Vehicle Act” that allows citizens to maintain and manage their voter registration through the MVA. Further, it is the law in all 50 states that voter eligibility is limited to U.S. citizens only. Convened as the County Council’s response to gather insights into the causes of low voter turnout numbers, the Task Force set to work to remedy the problem by proposing a host of methods, including enabling early voting, extending the voting time from 6 to 8 days, and even allowing same-day voter registration during early voting to be implemented in the 2016 election. However, even more disturbing than all of these, several of the Task Force’s other recommendations go even further to set the stage for large-scale fraud and violations of electoral process in a state that has already long been plagued with issues in this area, including documented recent cases of non-citizen and double voting that have yet to be prosecuted. Lowering the voting age in Maryland from 18 to 16 for county elections. This presents clear issues of judgment, maturity, and instances of candidates pandering to young voters and preying on their innocence to secure votes around popular issues of this age group’s concern, i.e. legalizing marijuana, lowering the drinking age, etc. Election Integrity Maryland has been at the forefront of eliminating voter fraud. Recently, they have recieved press in numerous publications regarding their efforts. 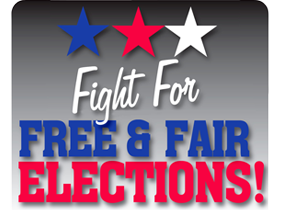 You can read all the recent articles featuring Election Integrity Maryland here. Discoverthenetworks.org recently posted an article featuring a long list of all the organizations funded by George Soros and his Open Society Institute. You can read the article for yourself here. Below is the press release from Election Integrity Maryland, detailing their involvement inidentifying duplicate voters in the state of Maryland. Letters from the Fairfax Electoral Board have been sent to county, state, and federal law enforcement offices requesting criminal investigations. With the exception of the Fairfax confirmation, the State Board of Election in both states have yet to report their respective due diligence actions. ROCKVILLE, MD – August 26, 2014- In late May, the Virginia Voters Alliance (VVA) and Election Integrity Maryland (EIM) turned over a file to each of the State Boards of Elections containing both Virginia and Maryland data of people that appeared to be registered in both states. The file contained 43,893 duplicate voters registered to vote in both states; an additional list identified 164 voters who apparently voted in both states during the 2012 Presidential election. The Fairfax County Electoral Board asked for and was provided with a subset list of voters that reside in Fairfax County. VVA provided Fairfax County 10,696 duplicate registrations and identified 17 likely duplicate voters. The Fairfax Board aggressively investigated the 17 apparent duplicate voters and sought the cooperation of the Montgomery County Board of Elections. The investigation confirmed all 17 (identified by their full name, DOB and SSN), demonstrating the immense value of VVA and EIM’s volunteer work linked to cleansing voter registration records. In striking contrast to the Fairfax self-imposed initiative, the Maryland Board of Elections has yet to respond to the alert provided to them of the dual voters, nor have they communicated what it is doing or has done linked to its obligation to exercising due diligence to investigate, report, and prosecute evidence of illegal or fraudulent voting practices set forth in federal law and the voting procedures of the United States. This latest data underscores the continued calls for Maryland and Virginia to correct and update its current system to ensure flagrant dual registrations and other paths to fraudulent electoral behaviors are eliminated. When one considers that this joint endeavor by two states identified close to 44,000 dual registrations the full impact of our “mobile society” is certain to have a negative bearing on 48 other states. By way of background, the VVA obtained the voter data for the SBE of Virginia and Maryland and the data was loaded onto a powerful server maintained by rVotes in Rhode Island. As of this press release, neither board has provided EIM or VVA with updates regarding the status of these parallel investigations. The VVA group has been asked by several more counties in Virginia to help them in challenging their local boards in investigating duplicate registrations and voters in their county. VVA has also been asked by several states on the eastern seaboard to conduct additional private crosscheck investigations. The Brennen Center will have to change their talking points … again. A year or so ago they had to stop claiming that voter fraud did not exist because there were too many reported cases identified by voter integrity groups like the VVA and EIM and conservative media like Fox News and Watchdog-Virginia. A common misconception is that voter fraud only occurs between Democrats and Republicans. That is not true. There is Republican-on-Republican voter fraud, as evidenced by what went on in Mississippi in the Cochran/McDaniel Senate primary race, as well as the slating of conservatives in Virginia. Marylanders, and indeed the American people, need to insist that we have open and honest elections and fraud-resistant laws. Otherwise, public trust in our election system will be forsaken and our Constitutional Republic in jeopardy. Rockville, MD – July 9, 2014 – Election Integrity Maryland (EIM), one of the Mid–Atlantic’s leading election integrity organizations, today re-affirms its concerns for the future of free and fair elections across Maryland, should the Online Ballot Delivery system be allowed to move forward. EIM’s President, Cathy Kelleher, will address the State Board of Elections to continue to voice its opposition to the system, and urge the body to heed the best interest of the voting public, at its upcoming State Board Meeting, set for 2pm on July 10, 2014 in Annapolis, MD. Over the past several months, Maryland’s Online Ballot Delivery System has come under the microscope for its alarmingly high vulnerability to large-scale error and fraud. EIM has continued to lead the charge for an in-depth review and rejection of Maryland’s overall online voting systems in a critical effort to preserve freedom and equality in the state’s electoral procedures. The organization’s efforts successfully blocked the vote to certify the online voting system at a Board Meeting held in April, 2014. Significant concern for the safety and security of the state’s online voting systems has continued to be raised, however much of the data that has been uncovered around the functionality and testing of these systems and their vulnerabilities have been restricted to closed sessions and not made clear to the public. Several independent Internet experts and University of Maryland law professor, Michael Greenberger, echo EIM’s continued urging for transparency and integrity in Maryland’s voting system. Greenberger has specifically pointed to the overall lack of authentication and oversight in online voting procedures, particularly in the request and delivery of absentee ballots. He has said, “experts say there is no way to know for certain that the person requesting the absentee ballot is the one filling it out and mailing it in…the identification system currently in place is not an effective way to authenticate a voter; in fact, it’s vulnerable to fraud.” Greenberger instead advocates for a reversion to the ‘old-school’ hard-copy, brick and mortar process to cut down on potential for interception and fraud. The State Board of Elections’ Deputy Election Administrator, Nikki Charlson, has also echoed these concerns that significant security vulnerabilities may exist in front end of the current system, the area ripest for fraudulent activity. Charlson was quoted in a recent article in The Maryland Reporter as saying, “We might not be able to prevent someone who has illegally obtained information [from entering the system].” Recent data compiled by EIM and the Virginia Voters Alliance confirmed 164 cases of duplicate voting between Virginia and Maryland in 2012, along with at least 44,000 individuals found to be registered concurrently in both states. These staggering findings, uncovered by a preliminary effort to simply ‘scratch the surface’ of this alarming issue, underscore the significant opportunity that currently exists largely as a result of the online voting systems, to commit fraud and exert negative impacts on the integrity of the states’ electoral processes which cannot be ignored. At its next Board Meeting on July 10, 2014, the State Board of Elections will re-open the discussion on the certification of the Online Ballot Delivery system, in an effort to continue to push the initiative through for approval regardless of the fact that these very clear, factual issues and countless concern from independent experts still remain to be properly addressed. The Board of Elections is planning to use recent complaints filed by the National Federation of the Blind on behalf of a number of blind and disabled voters, who portend that their rights to vote privately and independently were obstructed, as rationale for approval of these flawed online voting systems. This latest action highlights the Board of Elections’ continued failure to address and correct what have been found to be significant, measurable flaws in the current system that carry serious ramifications for the public’s electoral freedoms. Efforts by the Board of Elections to use these latest complaints by disabled voters to use potential ADA violation legislation as an engine to push the online voting system through ignores a number of key facts, however, that the state has issued to continually promote accessibility and equality in its voting procedures. Early voting, along with additional handicapped-accessible polling locations and extended time periods to cast votes were passed by Maryland’s General Assembly in 2014 to make it easier for disabled voters to get to the polls and ensure the presence of their voice in the state’s electoral processes. Clearly then, this legislation is far from sufficient rationale to necessitate a passage of online voting systems that represent flagrant security concerns and vulnerabilities that actually serve to obstruct the public’s voting freedoms, instead of expand them. Election Integrity Maryland is available for immediate comment to expand on these issues and related activities affecting integrity in the electoral process. Congress is considering a bill that could ultimately turn our elections over to Eric Holder and Barack Obama. The bill is HR 3899. Bill sponsors have named it the Voting Rights Amendment Act, but we’re calling it what it really is- the Voting Rights Segregation Act. If it is not stopped, HR 3899 will fundamentally and intentionally change American elections into race-reliant battlefields where, for the first time in our history, the United States would EXCLUDE millions of Americans from the full protection of the law – based solely on the color of their skin. HR 3899 also targets five states that will immediately be put under the authority of Holder’s Dept of Justice, requiring that they pre-clear election activities with Holder’s DOJ, effective immediately upon passage of the bill! The currently targeted states are Texas, Louisiana, Mississippi, Georgia and North Carolina. The Bill also gives Eric Holder the exclusive right to target other states for any reason he sees fit, including the passage and implementation of photo Voter ID laws. This Country has gone through too much and come too far to now watch silently as the professional race baiters in Congress, like Reps. Jim Sensenbrenner and Sheila Jackson Lee, divide voters into color blocks for partisan gain. Will you please help support True the Vote’s effort to kill this terrible race based bill? Earlier this week True the Vote led a group of pro-liberty election integrity organizations in requesting GOP House Majority Leader Eric Cantor to meet with our organizations to discuss the reasons this bill is an ill advised move toward race-based segregation. Last night, Cantor’s constituents let him know what they thought of his position on HR 3899- by voting him out of office. But make no mistake, the battle for HR 3899 is far from won. True the Vote will keep fighting to defend free and fair elections – but we need your support to do it. Please help us by making your tax deductible donation right now. Thank you, again and as always, for your willingness to take a stand for election integrity. Working together, we really can true the vote. Rockville, MD – April 22, 2014 – Election Integrity Maryland (EIM),one of the Mid–Atlantic’s leading election integrity organizations (empowered by True the Vote), announces today that it has urged the Maryland Board of Elections to re-evaluate its stance on online voting procedures and systems in wake of its upcoming State Board Meeting, set for 2pm on April 24, 2014 in Annapolis, MD. At this meeting, the body is set to certify its current Online Ballot Delivery System, which has high potential to open the state’s electoral processes to large-scale error and fraud. Stemming from significant concern from technical and political experts as to the vulnerability of the current system, Election Integrity Maryland calls for an urgent rejection of the vote to certify the Online Ballot Delivery System and subsequent review of its overall online voting systems in a critical effort to preserve freedom and equality in the state’s electoral procedures. In a recent letter to Linda Lamone, State Administrator of the Maryland Board of Elections, Election Integrity Maryland cites several concerns related to the high potential for fraud and inaccuracy in the current “same day registration and voting” system. Chief concerns, such as non-citizens reporting for jury duty, double voting, and deceased voters consistently appearing on the rolls, as well as potential for fraudulent activity, would be amplified by the state’s online voting processes. Recently, two historically-liberal states, Oregon and Washington, successfully voted to block the passage of similar legislation that would enable online voting capabilities and open the states’ electoral systems to large-scale error and fraud. Oregon was also supported in its fight by the League of Women Voters. The testimony collected in these efforts was also delivered to the Maryland Board of Elections for review and consideration prior to Thursday’s meeting and vote. Maryland has been challenged in the past by voting experts as a result of the significant shortcomings of its current online voting system. In fact, a nationwide, independent panel of experts even went so far as to name it among the ‘most vulnerable’ of all the state systems, and one of the most open to large-scale, automated fraud. Further expert testimony to support the current call to halt the certification of the Online Ballot Delivery System at vote this week can be found from Michael Greenberger, a law professor at the University of Maryland. In a recent article published in The Baltimore Sun, Greenberger said of the current lack of authentication and oversight in online voting procedures, “Experts say there is no way to know for certain that the person requesting the absentee ballot is the one filling it out and mailing it in…the identification system currently in place is not an effective way to authenticate a voter; in fact, it’s vulnerable to fraud.” Greenberger instead advocates for a reversion to the ‘old-school’ hard-copy, brick and mortar process to cut down on potential for interception and fraud. Recent data compiled by Election Integrity Maryland’s counterparts in both Oregon and California also supports the truth behind these claims. In Oregon, a host of credentialed experts identified numerous reasons why online voting is highly susceptible to a variety of system integrity problems, thus inviting nefarious actions. In California, an audit of current online voter registration systems revealed that 6,080 individuals duplicated their voter registrations, and these duplicates actually remained on the rolls through the 2012 election and through summer-fall of 2013. 113 of the 6,080 suspected duplicates also appear to have voted twice in the 2012 Presidential Election. Almost half of these voters were college-age (18-24). Elections are typically won or lost by extremely close margins, and glaring errors such as these thus become critically important to national outcomes. The Agenda for the upcoming state vote at 2pm on April 24, 2014 follows. Please note the meeting is open to the public, however request to speak must be submitted prior and approved no later than 5pm EST on April 23, 2014. To request permission to speak or for other agenda-related questions, please contact Nikki Charlson at 410‐269‐2843 or by email nikki.charlson@maryland.gov. Closed Meeting: Part of the meeting may be closed in accordance with Open Meetings Act procedures. Public Participation: Members of the public may address the Board on any item on this agenda. Pursuant to §3.2B of the Board’s bylaws, public participation at a meeting must be pre‐scheduled and pre‐approved by the Chairman. To request approval to speak at a board meeting, contact Nikki Charlson at 410‐269‐2843 or by email nikki.charlson@maryland.gov no later than 5 pm the day before the meeting.